Really weird film but I’ll be damned if I didn’t really enjoy watching it. This film is one of the best things to watch at Halloween because it is kind of a spoof sequel to one of the most classic zombie films ‘Night of the Living Dead’. That I believe is one of the films strengths in that it is done by people who know horror and wanted to add some dark humour to the genre and this worked perfectly in this film. Interestingly enough the two creators split their efforts when it came to the sequels and we had this film from Russo and Dawn of the Dead from Romero. Middle-aged family man Frank (Jim Karen) trains teenaged Freddy (Thom Matthews) for his new job at a medical supply warehouse. In an effort to impress and frighten his young charge, practical joker Frank reveals that the warehouse basement contains a cannister full of a mysterious chemical capable of bringing the dead back to life. It seems that the cannister fell off the back of an army truck during an accidental outbreak of zombiedom. Frank and Freddy unwittingly inhale the chemical and release it into the warehouse. Turning to the operator of a nearby crematorium for help in destroying the suddenly undead specimens that surround them, they unwittingly awaken the residents of a nearby cemetary just as Freddy’s pals arrive to party amidst the headstones and wait for their friend’s shift to end. Meanwhile, Col. Glover (Jonathan Terry) waits for the call that his missing chemical weapon has been unleashed. To start off let’s talk about the acting. The acting was good for the most part which was surprising from this film but they were acting like this wasn’t in anyway a comedy but it is, it so very much is. My favourite cast would either be Ernie the cremator or Burt the Factory owner who’s chemicals where the ones who caused the zombie outbreak in the first place. Something I really liked in the characters in this was how they were both mad and realistic at the same time. They were punk and high school looking kids with a bunch of other people in this insane situation which is really funny when everyone falls apart. I really liked the mention of the first film as if it is our world and the things that happened in the film were just a skewed example of a military experiment and there is this whole conversation between someone who has seen it all and a rookie which is one of my favourite conversations in any film because it connects the characters and the views. So let’s talk about something more fun like the visuals. The special effects and physical props were very good, well the zombies, half skeletons and gore was done brilliantly considering the time of 1985, the budget and the fact that this is a really good dark comedy horror film. The visuals shots weren’t the best but I think it is a part of the humour that the graveyard was clearly a studio set up, the factory and funeral house was also done in some Hollywood studio (I get its for budget reasons but I still consider it to be funny whether on purpose or not). Examples of really good visuals from the un-dead would be The Tar Man which should be imaged above and that woman who in half. 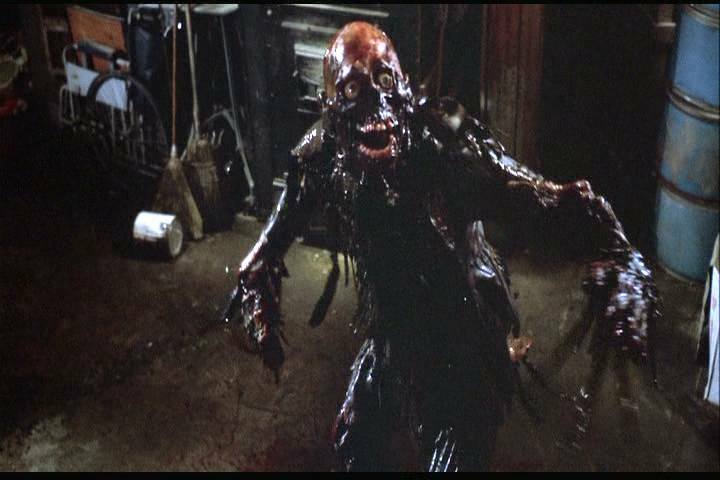 I had heard of the Tar Man before even seeing the film and certainly been noticing pictures of it recently what with the Halloween season upon us, I know it’s bad but I only actually saw this film about a month ago so I have no bias based on seeing this film in the good old days or whatever. The best reviews I found would be these “For pure eighties, punk rock, walking dead, brain eating mayhem, this is the film to watch.” Felix Vasquez Jr. Pure indeed, pretty much everything he said is easily agreeable when you watch this film. 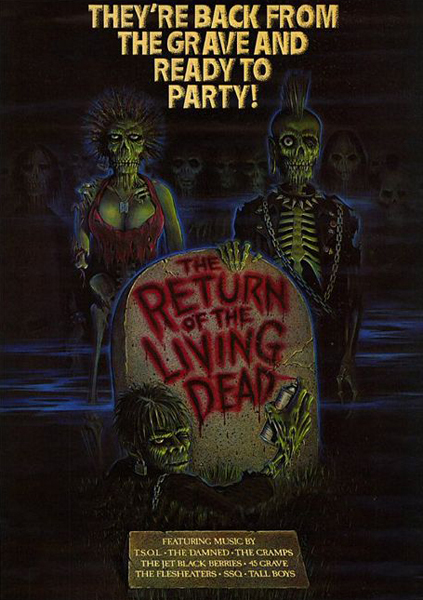 “Ed O’Bannon and John Russo may have intended The Return of the Living Dead as a comedy, but it’s just too damn gory, too scary and too good to be dismissed as a zom com.” Christopher Lloyd. I wouldn’t say it was particularly scary but it shouldn’t be just regareded as a Zom Com because it really is better than that. “A zom-com blessed with real tension and characters you can actually care about, it’s superior to at least three of George Romero’s Dead movies.” Ian Berriman. True, if I was any good at summaries like at the top of this then it would sound just like what this reviewer said. My favourite scene would have to be either the Tar Man saying “Brains!” or zombies asking the police to bring more cops, that really made me laugh. Do you wanna party? It’s party time . . . one of my favorites. Nice review – glad you liked it. Haha yeah 😀 thanks and I am glad you also enjoy the film. Cool movie and a cool write-up!! Fun review Tim. I want to see the Tar monster. Cabin in the Woods which is so much more than a monster movie got me going on zombie movies. On Netflix is recently watched Dawn of the Dead and Zombie Apocolypse 2012. Its hard to know what to watch I what order given sequelitis. Heck Friday the 13(h has almost a dozen movies but most are numbered. Its all fun. I re-watched Night Of The Living only a few days ago and read a bit about this film – sounds like a fun watch. I’ve never seen this sequel but did see Romero’s Dawn of the Dead when I was a teenager and liked it very much! 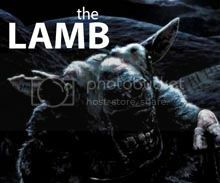 Looking forward to checking out this alternative sequel after your review! One Of My FAVE-FAVES, Fo SHO!! !